Fielding questions in the National Council of Provinces on Wednesday, Deputy President Cyril Ramaphosa moved smoothly between being comforting and stern. Our electricity problems will soon be a thing of the past. Our Post Office is getting back on track. Anyone who fakes their qualifications had better beware. A national minimum wage is en route. And he didn’t know the Guptas’ plane was the Guptas’ plane when he flew on it to Japan. By REBECCA DAVIS. If you think there is a crisis within South Africa’s state-owned entities (SOEs), the African National Congress’s (ANC’s) Mr Fix-It has news for you. “South Africa has well over 700 SOEs,” Deputy President Cyril Ramaphosa reminded the National Council of Provinces (NCOP). He said the majority of these are fulfilling their mandates effectively, but the South African public never gets to hear about them. What we do hear about are the basket cases: South African Airways (SAA), the South African Post Office, Eskom. On the topic of SAA, Ramaphosa said that a “focused effort by the board” had led to the “going concern status of SAA” being “restored”. But he also sought to stress the point that the global economic downturn was negatively affecting many airlines beyond the national carrier. “Those operating in the airline sector are facing headwinds both literally and figuratively,” Ramaphosa said. The Post Office was also at the mercy of external tides and competition, he suggested. “The Post Office is having its lunch eaten, so to speak, by courier companies,” Ramaphosa said. He acknowledged that the postal service was facing challenges, but assured MPs that a thorough diagnostic assessment of its difficulties had been undertaken, and a new business model developed. A new Post Office board has also been appointed. Ramphosa said that even while it was struggling, the Post Office continued to play a critical social role for those in deep rural areas in particular. The deputy president said the “war room” he led to look into Eskom’s difficulties had already made progress, with last weekend’s opening of power station Medupi’s first unit an “important milestone”. Ramaphosa is fond of delivering off-the-cuff lectures on the lessons South Africa can learn from China, and Wednesday was no exception. He said South Africans should consider the path that China has taken in listing some portions of its SOEs on the stock exchange. “Many people dismiss our journeys to China as though they know best,” he admonished his audience. Economic Freedom Fighters (EFF) MP Fana Mokoena suggested that all this talk of SOE turnarounds would come to nothing as long as the core of the problem remained corruption. “Corruption is pervasive in a number of areas,” Ramaphosa agreed, though he stressed that it was present not only in public enterprises, but also in the private sector, political parties, and even nongovernmental organisations. He said that wherever it was found within SOEs, disciplinary measures would be taken and criminal charges pressed. A similar issue was broached when United Democratic Movement MP Lennox Gaehler asked Ramaphosa what the government intended to do about the “regularly reported incidences” of people with fraudulent qualifications in the public and private sectors. 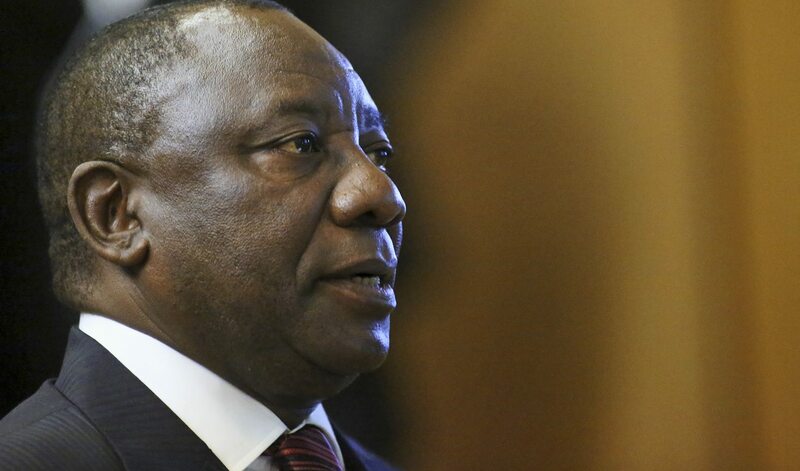 Ramaphosa responded that Higher Education Minister Blade Nzimande was preparing a proposal to put before Cabinet to root out this “terrible behaviour”. He said a national blacklist was being mooted on which those who falsified qualifications would be “named and shamed”. And penalties would go further: criminal charges, arrests, jail. “What a shame it would be,” Ramaphosa said ominously. A Democratic Alliance (DA) MP subsequently managed to use an unrelated question to mention ANC stalwart Pallo Jordan and SABC boss Hlaudi Motsoeneng, both implicated in qualifications scandals, but Ramaphosa didn’t take the bait. Though NCOP deputy speaker Raseriti Tau worked tirelessly to protect Ramaphosa from any vaguely threatening lines of inquiry, the deputy president volunteered to answer a question from the EFF about why he used an aeroplane belonging to the Guptas to fly to Japan last week. Ramaphosa said the defence force chartered a flight for him because there was no plane available from its fleet to take him to Japan. “They did not know who that flight belonged to, nor did I,” he stated. Ramaphosa said the information as to the aeroplane’s ownership only came to light later. “That is the reality, believe it or not,” he said. Ramaphosa was all put in a tight corner when DA MP Jacques Julius asked him if he would support a female president – a mischievous question, given that Ramaphosa is one of the leading contenders to take up the next ANC presidency. Ramaphosa dodged the question, projecting it onto the wider party structures. The ANC had 1,5-million members to choose from, he said. It “will go through the length and breadth of the country” in order to select the member to take the party’s agenda forward. The final issue of the day was that of a national minimum wage, which Ramaphosa seemed to confirm is on its way. He said the government was conducting rigorous research internationally to determine the right level for the wage: high enough for it to have a significant impact on poverty, but not so high that it causes job losses. Mokoena expressed scepticism as to whether a national minimum wage could be reliably implemented. He pointed to the routine under-compensation of forms of menial labour such as domestic work, even though sectoral minimum wages already exist.